A unique 1964 Porsche 901 Cabriolet Prototype is on offer at the RM Sotheby’s Paris Rétromobile week 2017 classic car auction. This historically important one-of-a-kind Porsche will be joined by two special Aston Martin cars: a 2003 Aston Martin DB7 Zagato and a 2012 Aston Martin V12 Zagato ‘No. Zero’. These cars individual rarities with early chassis numbers and bespoke one-off features. The first major classic car auctions in Europe traditionally coincide with the Paris Rétromobile week, which in 2017 runs from 8-12 February 2017. RM Sotheby’s Paris auction will be held at Place Vauban immediately after the Festival Automobile International, which runs through 5 February. This exciting event features a stunning display of beautiful concept cars and pays tribute to car designers from around the world. The 1964 Porsche 901 Cabriolet Prototype (estimate €850.000-€1.000.000) is the latest Porsche 911 aiming to sell for over a million dollar at public auction. In contrast to so many other of the “limited edition” Porsche 911s, this car really is unique and of historical importance. The Porsche 901, now known as the 911, paved the way for Porsche’s road and race car success. 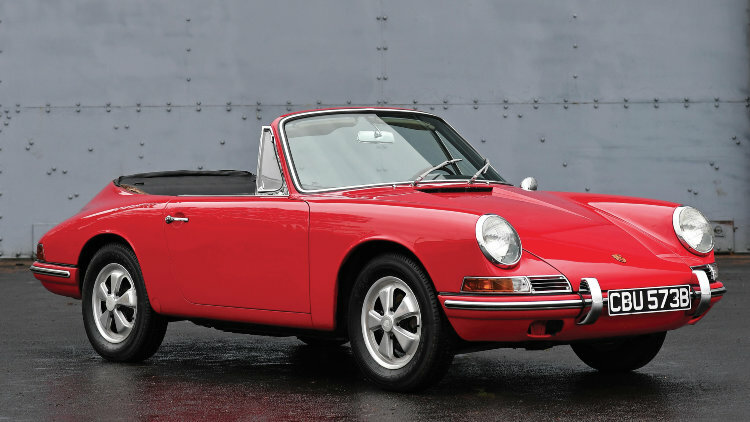 When Porsche was developing the 901, it made 13 pre-production models, of which just one was completed as a Cabriolet. The drop-top 901 was also the actual car from which the subsequent iconic 911 Targa concept originated, developed and evolved. RM Sotheby’s Paris 2017 auction will offer this 1964 Porsche 901 Cabriolet Prototype, chassis no. 13360, which is the second oldest surviving 901/911 chassis, and one of just two pre-production 901s still in existence. Sitting right at the heart of the birth of the legendary 911, and given its significant history and provenance, it would be a welcome addition to any important Porsche or classic car collection. Launched in 2002, the DB7 Vantage Zagato was the first Zagato-bodied Aston Martin since the V8 Vantage Zagato of 1986. The car on offer, chassis no. 700001, is the very first of just 99 examples produced. The vehicle’s current owner first saw the initial sketches of what would become the DB7 Vantage Zagato in a Basel nightclub. He immediately agreed to purchase the very first car, and signed a contract with the then Aston Martin Lagonda CEO, Dr. Ulrich Bez that night on the only slip of paper available – a napkin. The first Aston Martin DB 7 Vantage Zagato was eventually delivered in 2003, finished in Nero Black over Claret Red leather, and complete with optional extras including brushed aluminium trim in place of the standard wood, upgraded sat-nav and stereo, and a heated front windscreen. A carefully maintained example, it comes to auction accompanied by a numbered presentation book, numbered suede jacket and umbrella (Est. €350.000–€400.000). Immediately recognisable as a Zagato-bodied Aston Martin, the 2012 Aston Martin V12 Zagato was built to celebrate the 50th anniversary of the legendary DB4GT Zagato, and unveiled at the prestigious Concorso d’Eleganza Villa d’Este in 2011. With each vehicle taking 2,000 hours to create, coupled with a suitably extravagant price tag, just 61 road-going cars were constructed. RM Sotheby’s has sourced the ‘holy grail’ of the limited group, ‘No. Zero’, a special commission made by Aston Martin, complete with distinctive design cues by Aston Martin’s bespoke ‘Q’ department. Supplied new to Paris in late 2012, the then-owner worked closely with Aston Martin to create ‘No. Zero’, complete with one-off Zagato-badged key, unique painted fixed wing and a one-of-one Scarab badge. At the time, Aston Martin didn’t allow bespoke badges to be added to the V12 Zagatos, but made an exception in this case, creating a yet unrepeated one-off Scarab beetle design ‘AML wings’ badge on the nose of the car. Offered at RM Sotheby’s Paris 2017 auction by its first owner, ‘No. Zero’ remains today one of the most exclusive—and individual—Aston Martins available on the market, and would be the crowning glory of any collection (Est. €625.000–€675.000). These cars will join the previously announced 1934 Alfa Romeo Tipo B P3 pre-war Grand Prix car raced by Scuderia Ferrari at the RM Sotheby’s Paris 2017 classic car auction.